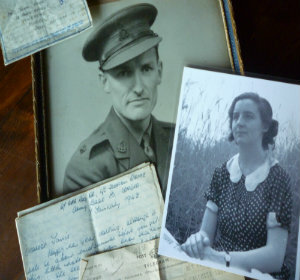 My novel Counting the Days embraces the full correspondence, starting in 1932 with the innocent flirtations of an eighteen year old girl to a seventeen year old boy, and ending in 1946 with the letter from an army officer to the wife he had been separated from for five years. “On Active Service” concentrates on the war years, reproducing the letters verbatim on the actual dates they were written 73 years ago. Supplemented by the diaries my father-in-law kept and the photographs he took, this is social history told first-hand.